On November 21st 2010 at 9:28 a.m. PST is the second of the five Full Moons in a row that are in the last degrees of a sign. Besides being predisposed to the sign it is about to leave, it is starting to be influenced by the sign it is moving toward. The ruler of Taurus is Venus, and with Jupiter, both have recently turned direct with Jupiter conjunct Uranus and square to Mars and Mercury, ruler of Scorpio and Gemini, respectively. A planet that goes retrograde or direct, must be considered having more than a subtle persuasion, doubling it’s’ effect it has on the other planets. All this is indicating that we need to break away from our old normal way of solving any situation. Acknowledging and recognizing our ability to think out of the box and to see the variety of steps and solution to solve each situation, which will come easier at this time. This is the moment we will be more flexible in our thinking, and the need to look and address our fears and demons is very timely. By facing our fears and demons with the astrological aspects as they are at this moment, we may come to the conclusion, that some, where never as important as we thought they were, and others have gone by the way side. By clearing out the closet of outdated negative thoughts, we will make room for the positive creative thoughts and wishes to build the future we desire. “The Sabian symbol for the Moon in 30 degrees of Taurus and for the Sun in 30 degrees of Scorpio is taken from “The Sabian Symbols in Astrology by Marc Edmund Jones”, and what follows are my comments. Taurus 30 A peacock parading on an ancient lawn This is a symbol of the proper dignification which can be given to superficial excellencies, and of the momentary elevation of the individual beyond his capacity or worth as he is able to exhibit the various ideals of others in his own person. There is an insouciance of vulgar display that serves a purpose here, encouraging men to strive for outer ornament when they are as yet unquickened to inner or eternal values. The keyword is aloofness. When positive, the degree is a special flair for dramatizing the heritage of the race or for capitalizing on the lessons of history in some special fashion, and when negative, a wholly unrewarding if not destructive self-contemplation. Scorpio 30 The Halloween Jester This is a symbol of a proper informality in the release of the buoyant energies through which an individual gains refreshment, or is freed for the moment from life’s insistent demand on him that he live according to some ideal beyond his potentiality. The dignification of what often becomes an overbroad humor here serves its purpose by encouraging man to attempt new and various modes of contact with his fellows, and thus ultimately to achieve a more genuine spiritual sensitiveness. The keyword is spontaneousness. When positive, the degree is a gift for making the desires and ambitions of self not only of interest but of actual value to others, and when negative, ineptness of self-expression and contempt for established values. This Sabian symbol brings out the need to show to others who we are and what we have. Many times in the beginning of understanding what we want and need, we imitate and pretend to have what we don’t have. The first rule of creating your wishes is to be what you want to be. If you wish to have wealth, you need to express prosperity in all your actions and thoughts, even if you actually don’t feel it or understand it. It is through constant repetition that it finally materializes into reality. It is in understanding that similar things attract their own kind that we begin to understand how the Laws of Attraction works in obtaining what we wish for. It is through living beyond the apparent reality, that the reality we are working towards materializes. This can only be achieve by facing our fears and demons, and seeing the reality as we want it to be and working with astrological aspects and energies to arrive at that which we desire and wish for. Being a student of astrology when one sees injustice in a situation, one wonders what purpose the Universe has for the individual and whether the conditions, reasons and possible outcome would show up in an astrological chart. This question came to mind recently when a fellow co-worker was being mistreated by his superior with a reduction of salary and more work. 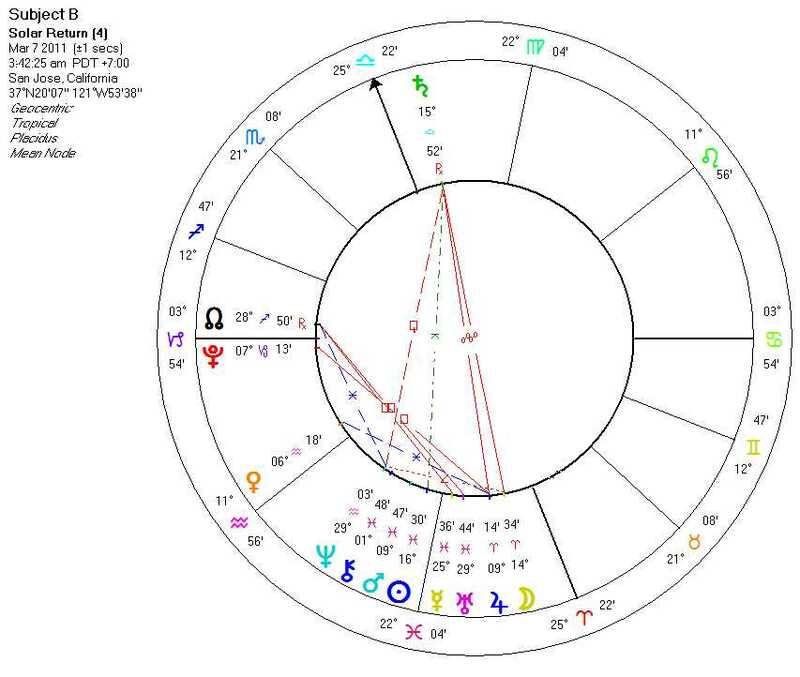 I was certain doing a horary chart would describe the situation, but would it give an answer to the outcome of his troubles? Or could the chart give clues to the different avenues of approach one needed to work with? As I am more at home with solar returns I decided to set up a chart for the coming year to find out what I would see about his circumstances and finances. To my surprise and delight, not only did it show the conditions as they are, but in my opinion gave clues that would help the problem come to a better finale. It gave me the keys to what the individual would need to do to rise above what was happening in his life, and at the same time venture into new areas for exploration. When one first looks at the solar return chart, the planet Neptune stands out in the second house of finance indicating monetary uncertainty caused possibly by the individual or by outer circumstances. Looking at the lord of the sign of Neptune and its aspects, one surmises that the fears, frustration and anxiety is more in the mind and emotions of the individual, rather then the surrounding reality. I am not saying the period is not difficult, but the fears are guiding him into a survival of the fittest state of mind which will be the individual’s saving grace to move forward to success and growth. Frustrations comes from the Sun in the second house expressing his need to improve his self confidence, his feelings of being underpaid, a need to reassess his worth, his feelings of instability and his need to map out a plan for financial security for himself and his love ones, especially his children is evident. Morin always places emphasis on any planet conjunct an angle, and the natal house placement of the solar return ascendant and midheaven. Solar return Pluto conjunct the first and on the angle, creates a need for transformation, reinvention, power, strength, and the motive and determination for real change. With a definite attitude adjustment for the better, and a possible career and company change, one or both is in the air. 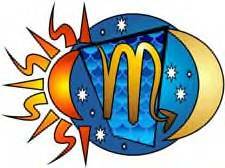 Another important factor is if the natal midheaven conjuncts the solar return ascendant, as it does in the individual’s chart, it brings optimism, hope and improvement in his status and career. In this case, whether the situation at work will improve or an outside position is offered is still in the offerings. The real cliff hanger is that Pluto is forcing his hand in making him take more control of his destiny, by no longer going with the flow, but using his talents and assets. In his natal chart his intuition and instincts are highly emphasized and his ability to see situations in an unusual light, especially when it comes to investments and taking chances is to his benefit. Not allowing fears or thoughts to complicate his first impressions and intuitions will be to his advantage as Pluto works its magic. In the third house with Jupiter, the conscious and unconscious levels of thoughts and his ability to think in and out of the box will be his key to accomplishing what he desires. He needs to avoid the anxiety and nervousness activated by Uranus which will cloud his judgments in gathering information and facts before making a final conclusion on any matter at hand. My final thoughts on Neptune in the solar return second house are that it does encompass aspirations, disillusionments, visions and intuitions. Whether we use one or all of them is depended upon the individual charts and their aspects. Neptune in the second is the planet of hopes and wishes to be accomplished, such as becoming self-employed, doing major home improvements, saving for the future, et cetera. The fears, frustrations, and anxiety are created from the limited and restricted financial funds available to work with at this time. The planet’s energy is showing its handiwork with the recent recession with many companies cutting salaries and hours. The global consciousness is showing up in individual’s charts by representing and expressing the global fears and anxiety as their own doing. Understanding how Neptune works, and making positive and realistic moves towards our goals and dreams is our hope for smooth sailing, as the waters are not as rough and dangerous as they appear. At 6:38 p.m. PDT on October 22, 2010 at 29 Aries 32 is the first of five Full Moons in a row that occurs in the last degree of an astrological sign. We are experiencing the end of one way of thinking about things as we come to the final end of a sign in the zodiac, and are beginning a different view point as we approach and enter a new sign. This is the sacred portal where the past and the future can be observed simultaneously. It is the betwixt and the between of the two worlds of what was, and to what it might or can be depending on the actions we continue, or change. Aries is proclaiming “I am” here and the essence of being is felt with energy, enthusiasm and action. With Taurus stating “I have” the need to possess and have possessions which defines who and what I am, as well as a being who thinks. This Full Moon is reminding us to encompass unconditional love in all our dealings, projects and relationships, and at the same time we need to let go when the time comes. In the past year the aspects have indicated that change needed to take place in our lives, and if this has not happen because of our old habits which are unfortunately hard to get rid of. This period of time demands us to take action, and no matter how painful or difficult, to let go of the old and make room for the new. We need to define or redefine who we are and what direction we need to take, as we can no longer follow others blindly on good faith. 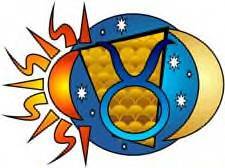 “The Sabian symbol for the Moon in 30 degrees of Aries and for the Sun in 3o degrees of Libra is taken from “The Sabian Symbols in Astrology by Marc Edmund Jones”, and what follows are my comments. Aries 30 A duck pond and its brood This is a symbol of the eternal fitness of things, provided the individual take the fullest advantage of the cosmic ordering. Implicit in the symbolism is man’s ability to establish his world of experience according to his own needs, and to function effectively because he has the acumen to align himself with his own genius and to seek a personal satisfaction in a simple efficacy of being himself. The keyword is reliability. When positive, the degree is an accustomed competency or ease in dealing with immediate circumstances, and when negative, a tendency toward provincialism or an acceptance of life with an altogether uncritical complacency. Libra 30 Three mounds of knowledge on a philosopher’s head This is a symbol of the eternal fitness of things, as it lies within man’s power to comprehend this for his own special guidance. Implicit in the symbolism is a challenge to each individual to develop full and equal potentialities of skills, allegiances and ideals, and to recognize cosmic order through its manifestation in his own person and affairs. In this fashion he comes to know the world, and thereupon is able to anticipate the ways of its going. The keyword is prescience. When positive, the degree is a perfected integrity of self and an exceptional gift for furthering all progress, and when negative, a fatuous pride in mere intellect. When we begin to experience and appreciate the essence of our being and its connection and purpose with the Universe, we will then begin to understand, to recognize, to fulfill and to bring into reality to its fullest potential, our goals and wishes within the cosmic order of this world. It is in knowing and recognizing that nothing can be materializing into this planet without following the rules, the regulations and the order of the Universe. It is the gift and the magic that allows us to enter the sacred portal of betwixt and between that we are able to glimpse our spiritual connection with the Universe and our place in the Divine scheme of things. Understanding this, provides us with the competency and ease to deal with any situation for further progress as we continue our journey in this life.